LONDON - GoViral takes a look at the best new viral advertising on the web. After the Sony Bravia campaigns, the bar was raised as to how to promote HD televisions. Samsung joined forces with The Viral Factory, London and came up with this highly untraditional way of communicating the high quality of its new LED screens. An extremely talented shepherd and his crew navigates hundreds of sheep around the hills with LEDs on their backs to simulate a huge LED display. Compared with other virals, the video’s 2.44 minutes seems rather long, but the high quality of the content compensates for the length. Within the first month, the video produced more than 8.1 million views over the five largest video-sharing sites. According to The Viral Video Chart, it further generated approximately 3,000 blog posts and 8,300 comments. Samsung has had a great spring this year. This viral was released on YouTube, challenging users to figure out how it was filmed. The video was shot on the new Samsung I8910 HD in one take with no post-production or special effects and holds several impossibilities. There are several clever aspects about this viral. It intrigues users to watch it, at least, a couple of times. Further, it motivates users to freely and participatory to engage in depth with the content, if they wish to solve the mystery – and many did. In solving the challenge, more than 1,500 viewers commented on it and it also yielded a high video response, debating and discussing possible solutions. The video produced more than 650,000 views within the first two weeks. Watch why, and feel free to try and figure it out, before you click your way through to the solution. 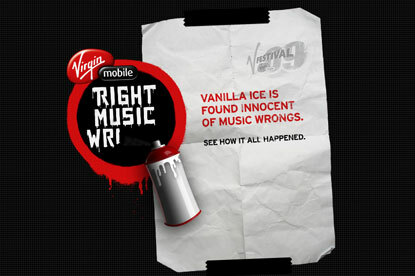 Virgin Mobile Australia recently launched a campaign for undoing all the musical failures of the past. It wanted to make a stand against bad music and created this online campaign. The videos can be found all over the internet and the campaign website is loaded with content for users to immerse themselves for hours at a time. Some of the main features include the Top 10 Music Wrongs chart, presenting some of the major wrongs, mainly from the 90s. The creative idea behind the chart is to open a national debate on what bad music really is. Vanilla Ice was put on trial and forced to pay his apologies for his best-selling rap song – Ice Ice Baby. Users can report a wrong themselves, which further add to the community feel and potential for user engagement. This way, Virgin built an entire universe evolving around music, thereby constantly allowing users to interact with the brand while building a strong relation between users’ music and the Virgin brand. Vodafone teamed up with the Formula One team Mercedes McLaren to promote the new BlackBerry Storm, purpose-built for Vodafone. The phone holds an abundance of multimedia capabilities, which were the focus for the video. The guys at BlackBerry built a small remote controlled race car and used the BlackBerry for steering. They then took it to the McLaren crew and let Lewis Hamilton drive a genuine Grand Prix car with the remote. The idea is very original and demonstrates the potential for multimedia integration today. The video produced more than 1.4 million views within the first six weeks. This rather untraditional campaign features the drummer from the Swedish 90s garage/rock-band Hellacopters. Doing an unbelievable drum solo on a drum set built entirely out of ice. The dynamism of smashing the drums in the end seems to reflect the re-occurring change of the Icehotel in Jukkasjärvi, Sweden. Every year, when winter falls, they build the hotel once again for the new season. The video generated approximately 500,000 views within the first month, which is very impressive for a brand that is not well known internationally. Watch also the very interesting "making of" video.